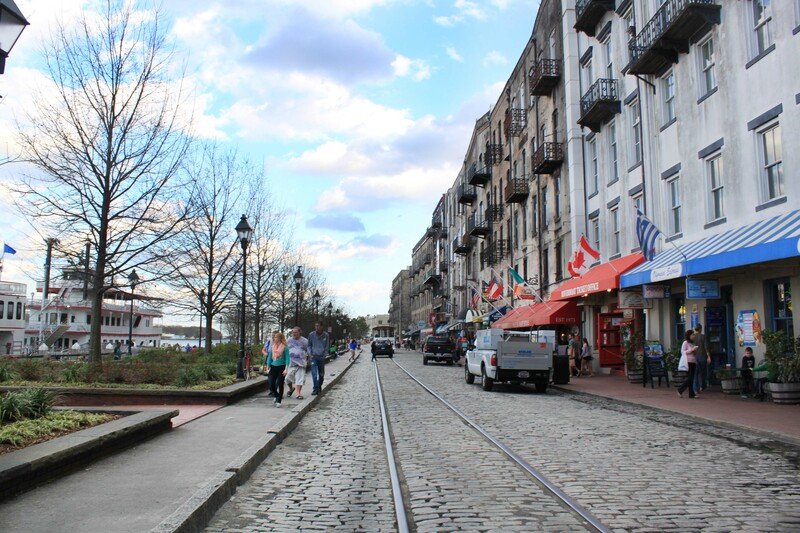 Savannah.com » When is the Best Season to Visit Savannah? When is the Best Season to Visit Savannah? Savannah’s not just a city; She’s as much of a character as those who live among her history, palm and live oak trees, with Spanish moss hanging like streamers for an eternal party. Like any personality, Savannah has her moods: spring, summer, fall and winter. Though each one is unique, all four of Savannah’s seasons provide consistent airs of unpredictability, excitement and authentic southern splendidness. Here is a glimpse of what this year holds for this southern belle of Lowcountry cities. Savannah’s location in the Coastal Empire might mislead guests into thinking the temperature never drops below 60 degrees. What’s wonderful about spring is that it features a bit of summer’s heat with winter’s cooler winds. 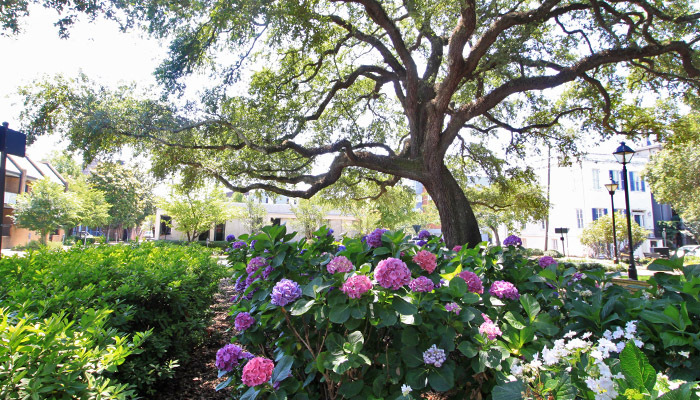 The stars of spring are the blooming pink azaleas, which decorate the bushes of Savannah’s squares, from March to April, and add a dash of vibrancy to events such as the Savannah Tour of Homes and Gardens. Speaking of touring, Savannah’s music scene reaches its peak with the Savannah Stopover and the Savannah Music Festival in March. Spring also signals the unofficial season of luck, with one of the nation’s largest St. Patrick’s Day parades. 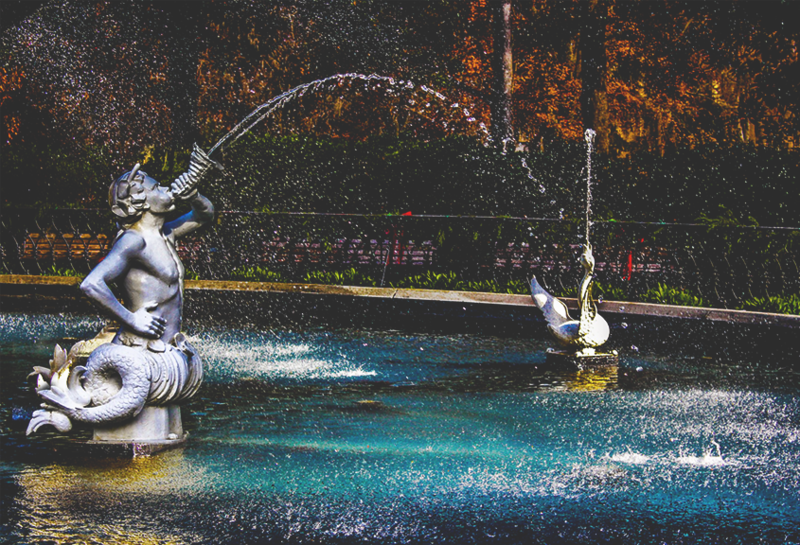 You don’t know serious celebration dedication until you witness the dying of the Forsyth Park fountain shamrock green. The highlight is the parade to end all St. Paddy’s Day parades, which travels across the Historic District, igniting the luck of the Irish throughout Savannah’s streets. Summer in Savannah is (literally) the hottest time of the year to visit, which is a good thing for those looking for a quick getaway. During the hot southern summers, all kinds of businesses, from hotels to sightseeing tours, offer deals and discounts you won’t find during the other seasons. Indulge your inner, deprived beach bum by visiting Savannah’s beautiful and secluded neighboring islands. Less than an hour drive away, both Hilton Head and Tybee Island offer ideal escapes for weekend or day trips. The biggest bash of the season arrives in early July, as Tybee’s Independence Day fireworks light up the South Beach Pier in tandem with Savannah’s own display over the Savannah River. Before night falls, River Street hosts its traditional Fourth of July Celebration with free admission and live music stretched along its iconic cobblestone walkway. However, you don’t have to wait until July for an excuse to enjoy the heat. River Street also entertains jazz enthusiasts and foodies at their Savannah Blues, Jazz & BBQ Festival. Sponsored by the Savannah Waterfront Association, this signature outdoor celebration of deep southern blues and barbeque features renowned local musicians and the city’s best BBQ vendors. Pardon the pun, but there really is no better time to “fall” in love with Savannah than in autumn. Much like spring’s balance of hot and cooler, fall, weather-wise, is a pleasant transitional period from the humidity of summer to the slight sweater weather of winter. There may not be an array of leaves changing colors, as evergreen trees dominate the Hostess City of the South, but there certainly is an array of exciting events and fun fall festivals. Compared to summer’s calendar of events, fall’s itinerary (along with hotel rates) triples thanks to milder forecasts. Next to spring, fall is one of the most active times for Savannah due to the volume of high-profile events, notably the Savannah Film Festival, a weeklong celebration of cinema’s next-big-films. The fall fun commences in September with every meat lover’s dream, Bacon Fest on River Street. The Savannah Craft Brew Fest is a great way to wash down the many meals eaten over Labor Day weekend. October welcomes in German beers and bratwurst for Savannah’s Oktoberfest as well as buccaneers and extravagant costumes for the Tybee Island Pirate Fest. The holidays in the South introduce a special lineup of traditions, from Savannah’s Lighted Christmas Parade to the Up the Cup New Year’s Eve Celebration on River Street. Christmas decorations are taken quite seriously in Savannah, with the city decking the street lights along Broughton Street with garland and a large Christmas tree at the intersection of Bull Street and Broughton near the old Levy’s jewelry store. 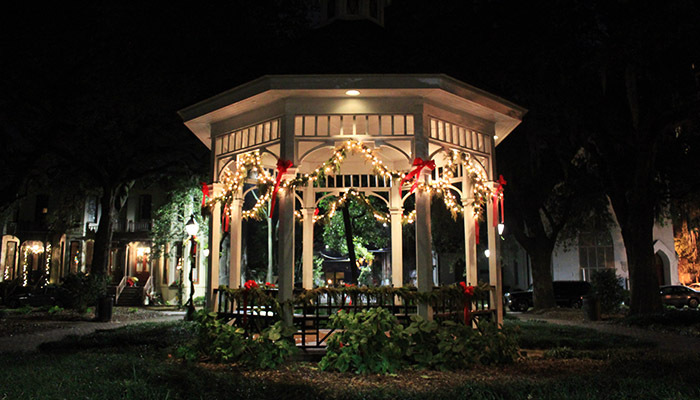 Almost every square is adorned in ornaments, lights, and Southern yuletide splendor. It’s an incredible time to enjoy the city, as the crowds all but dissipate, all the tours continue to operate and the weather usually stays in the mid-60s. Come January, the holiday season evolves into a period of entertaining educational events like the Black Heritage Festival. Timed to coincide with Black History Month, this month-long series of events include performances and an arts festival all throughout February. Also in February, the Savannah Book Festival hosts distinguished keynote speakers and best-selling authors for a weekend dedicated to the power of writing and reading. Two smaller, albeit equally enjoyable, film festivals also make their way down south in January and February, the Telluride Mountainfilm on Tour and the Gray’s Reef Ocean Film Festival.